So your plane leaves at 9:50 PM from O’Hare airport and you need to check out from the motel at noon. What do you do? Well, using the information I had from the first day I was in Chicago, I took all my luggage, dragged it back to Union Station, stuffed it into a locker and, armed with only my backpack and camera, I was ready to visit some more of Chicago. This time, the weather was excellent: the sun was shining, the sky was clear :D.
The basic route for this day was from Union Station passing the Willis Tower right onto Millenium Park. From Millenium Park I headed towards the Hancock Observatory, which was my first target of the day. Along the way I was also able to do some really nice shots of the city. While doing the photos I noticed, that the sky started to fill up with planes doing acrobatic moves, while painting interesting dust-shapes onto the blue sky. It was Navy Week in Chicago, so the Hancock Tower (or the top of any other high-rise) was the place to be that day. I was lucky to get to the Hancock Observatory before the crowds, so after paying the $17.50 simple pass I was quickly able to get to the top. The tower is not the highest in Chicago, the Willis Tower is, but I have already visited the latter while I was there the last time, plus, they say, that the view from the Hancock Observatory is nicer. Indeed there is probably more to see from the Hancock Observatory as David Schwimmer points it out in the audio-guide (included in the entry price). Being Navy Week it was also nice to see the acrobatic moves of the planes from above. One can rarely have that perspective 🙂 . I think the only down-side to the day was the fact that the planes continued circling above the lake and the downtown area, which is OK for small propeller planes, but when the navy fighter-planes and the Blue Angels started to circle, the noise got really unbearable (although it was awesome 😀 ). The show stopped for a while at around 4 PM, so I could enjoy a nice stroll back to the southern park, just to see once more one of the biggest attractions of Chicago before leaving to the airport. The target was Buckingham Fountain, the famous fountain one can see at the beginning of the popular sitcom Married with Children. The idea with this fountain is to make sure to be there on the hour. That is when it looks best, trust me 😉 . After some relaxing a bit in the sun at Buckingham Fountain, I was ready to leave Chicago. It was my third time there, but I hope not the last… :). I have completed the albums with more photos: here. So I am back with the story of my visit to Chicago. The first day was to be dedicated to mostly the city center, but apparently the weather was not really on my side, so after a short stroll (if going from Millenium Park to the Museum Campus can be called short) I decided to visit some indoor attractions. The first target of the day was the Field Museum, which I could not fully visit the first two times I was in Chicago. The museum does not exhibit beautiful paintings or statues, but something that I like much more: the evolution of our life on Earth. The exhibit ranges from stuffed animals, via ancient cultures to the all majestic dinosaur exhibits. The field museum is, I think, one of the best of the latter: the skeleton of the T-Rex, Sue, is the most complete on Earth. Also the skeleton of the huge brachiosaurus, has it’s place at the museum. 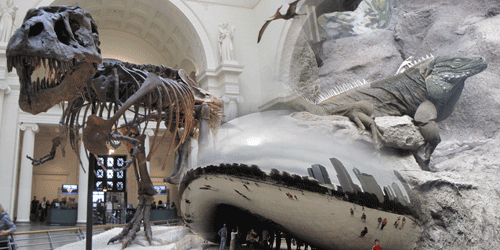 The basic entry price to the museum is $15, which can be spiced up to over $30 if one includes all the special exhibitions and 3D movies about Sue. For me, spending that much, would have granted access to so many exhibitions, that it would have taken the entire day to visit everything, so I decided to stay with basic access: and I did not miss a thing of the flavor of the museum 😉 . The whole visit took me 2 hours or so (and I was not taking the visit slowly), so I think it was money well spent. After getting out from the museum I realized, that I have about 3-4 hours to see another indoor landmark. Well, there was a huge line at the entrance of the Shedd Aquarium and I was hungry, so I decided to stand in line at the hot-dog stand instead (it was long, but not as long as the aquarium queue). While eating the delicious Chicago style hot-dog I remarked, that the aquarium queue is actually moving quite fast, and I had to do something while eating the hot-dog anyway, so ‘I might as well stand in line’ I thought 😉 . And indeed, I made it up to the aquarium entrance in no time. The Shedd Pass costs $28.95, which gives access to 80% of all attractions, is not the cheapest, the $8 “General Admission” ticket is, but I think the latter ticket covers only about 30% of the total attractions, so… I went for the first one. The aquarium is really nicely arranged, presenting a huge range of aquatic life from the very small fish to the playful belugas. Also reptiles have a few representatives there. For example a giant anaconda (a REAL giant) lurks in one of the tanks which was quite impressing. The penguin area is also nice. It was funny to see how friendly the penguins were with the keepers, who were just there, petting them. The shark tank was a bit of a disappointment (the aquarium of Genova I think is much better at that chapter): it was badly lit, I could not see much. The beluga tank and the dolphin tank, however, made up for the loss in quality. There was actually a newborn dolphin in the tank, swimming around with the proud mother, so that was something really out of the ordinary 😉 . The visit to the aquarium actually ate up the remaining time I had before I had to head off from downtown, so that was it for the first day. I think it was time well spent 😉 . I have uploaded the photos made that first day here. Immediately after coming back to work I got the news, that I will have to search again for someone to replace me in the office: I had to go with some job related stuff across the ocean. 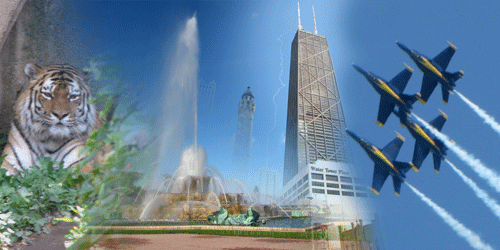 The target city was nothing else than one of the greatest cities in the U.S.: Chicago. It was actually my third visit to the city (the first two were two short visits while I was working in the U.S., six years ago, in a summer), so it was nice to see what changed, how the city looks like now. I have to say, it still looks great :D.
I think I will be covering my visit to Chicago in more than one post, because, there are some important details I think I need to share first. The first thing is: where to stay at? Well, I think everyone knows, that in the U.S. people are like sitting ducks without a car, and… well I was a sitting duck… I needed to find a relatively cheap accommodation, close to both O’Hare and the city center. This is of course impossible, because the two locations are quite far away from each-other. There is, however, very good public transport between O’Hare and downtown. It is called the CTA blue line, and it is a suspended/underground train which connects the two points just for people like me (a 45-50 min. ride). 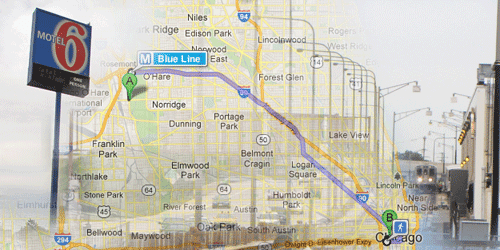 So, the target was to search for cheap accommodation among the blue line. And the winner was this Motel 6. It is a 30 minute walk from the blue line’s “Rosemont” station, BUT there is a sidewalk on the road (something rarely seen there), so it was ideal for me, therefore I have immediately booked a room there. The next important thing to consider in Chicago is: where to keep your luggage, if your plane leaves in the evening and you still have time to see the city? Well, O’Hare has suspended it’s locker service due to security reasons. Motel 6 has no locker service and you need to check out at noon. There is, however, a locker service at Union Station, the main train station of Chicago, which is luckily a few hundred meters away from the blue line (“Clinton” station) downtown. There one has the possibility to store luggage for a reasonable price (after 3 hours a flat rate of $15 is applied, a rate which is totally payed when you pick up your luggage). One thing to know is, that although it is relatively close, finding Union Station after getting out from the underground Clinton station is no easy task. Luckily I met a “homeless tour guide” who helped me out for some change 😉 . As I had the two, probably most important, points sorted out, I just needed to connect the dots and get via the blue line to the city center. A fare costs $2.25, an amount which can be loaded to specially printed CTA cards at wending machines at each CTA station. If you have no change, don’t worry, the cards can be used more than once, each time subtracting the fare amount from the total available. The cards can also be re-loaded with money at any other wending machine. At some stations it is a bit hard to go through the revolving gate with all the luggage, but the guards at the gates can be asked at any time to help you out 😉 . If you do not know the city, you can buy a map at Union Station, but please for the love of God do not do it. You can always get FREE maps everywhere in the city. I just did not know that, but now you do ;). Getting around even without a map is doable, just make sure you always know in which direction the lake is. That is east. If you head east, you get to the lake, from the lake you can always start over 🙂 . So there you have it. These are the basics. I will be back with more details about the actual visit soon. Last year me and two colleagues of mine have decided to do a trip which is a little bit out of the ordinary: a West Coast to East Coast road-trip in the U.S. 🙂 . Well, our plans started to develop and develop right to the point when we have started to take our first steps to get there: get a passport and then apply for a visa. The passport part was fairly easy: my new biometric passport was ready in a few weeks and I was really surprised of the promptness and speed of the authorities this time. 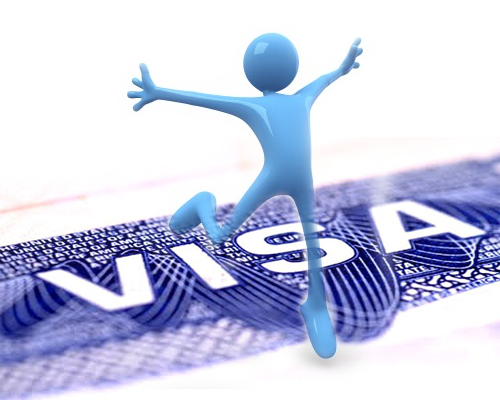 But this was the first and easiest step of all, the biggest was the one that followed: apply for a U.S. travel Visa. The exact information can be found here. So far simple, right? Well, after following these steps, on February the 2nd at 9:15 me and my friend (the third person had to abandon 🙁 ) arrived promptly to the U.S. Embassy in Bucharest. I was actually “happily disappointed” by the changes they made since my last visit 5 years ago (J1 Visa for 3 months). Now there are lockers for your bags and for your phones which are kept secure while you are inside the building. There is also a reception where you can hand in the most important documents (DS-160 confirmation page and passport) so you don’t have to carry it in. It seems they really have developed over the past 5 years, something I cannot say about Bucharest: unfortunately now it looked much worse than before (I honestly cannot even compare it to Cluj). After two halls in which I had to wait to be called into the next one and after a fingerprint session (even though I had them taken 5 years ago) I finally arrived to the agent. This was the moment of truth: could I apply for a U.S. Travel Visa without an invitation, without a contact person or without even any proof of having any real-estate which assures that I will get back? The answer is: YES, the words “Your Visa has been approved” never sounded more reassuring: getting to the U.S. is not a big thing anymore. I can travel there anywhere for the next 10 years 😀 . In my case having had previously a visa helped, but my friend has never had one and yet he received the visa even so. A few things they liked: we have both traveled a lot in Europe already, we had stable jobs back home and we spoke English fluently (although the agents spoke also quite understandable Romanian <= respect 😉 ) The next day we already bought the airplane tickets: on Expedia our purchase has been confirmed. This means that the big step has been made: we are off. If nothing goes wrong, I might just have quite a few things to blog about 🙂 .